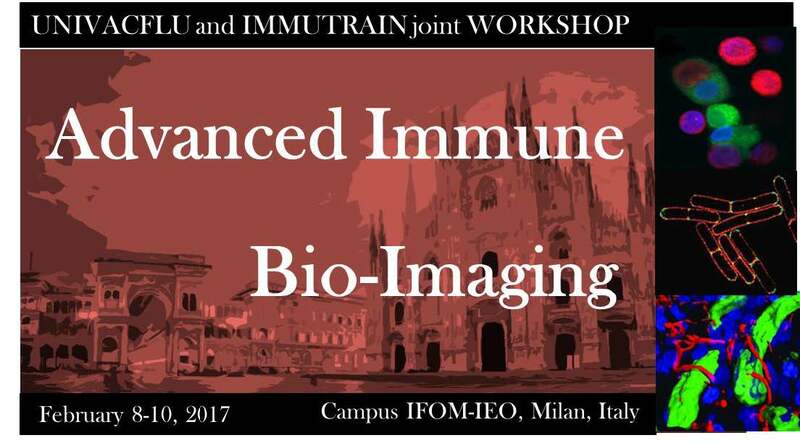 23.02.2017 - The Advanced Immune Bio-Imaging workshop was held at the European Institute of Oncology, IEO, in Milan from the 8th to the 10th of February 2017. It brought together experts in the field of advanced imaging with a particular focus on imaging the immune system. Young researchers from 17 different European labs learned new techniques of bio imaging and microscopy. This workshop was a joint effort of two training networks funded by the Marie-Sklodowska Curie program of the European Union: IMMUTRAIN-Innovative training network for the immunotherapy of cancer and UNIVACFLU - Universal Influenza Vaccine network. The first part of the workshop included lectures on the basics of optical imaging and an overview of imaging techniques before concluding with an introductory “get along” session in which each young researcher, so called Early Stage Researcher (ESR), presented him/herself. During the second part, external speakers shared their experience in using different imaging techniques, such as super resolution microscopy, two photon microscopy, mass cytometry or “CyTOF” imaging and nuclear imaging. These talks introduced how and when these techniques can be applied to image the immune system in the context of infectious diseases or cancer covering the main research fields of the two networks. Moreover the ESRs had the chance for further discussions with the speaker(s) during the breaks. Interestingly, the ESR’s of the two networks were able to exchange their research experience which despite different application finalities, had a common background of optimizing therapies based on the immune system. This allowed a more enriching scientific experience for both networks. In addition to the talks about bio-imaging techniques in research, the workshop also included two social events: an aperitif and a social dinner where all the participants, ESRs, group leaders, and speakers enjoyed a nice Milanese dinner together with interesting discussions. The workshop concluded with a supervisory board meeting of the IMMUTRAIN network group leaders followed by another meeting of the ESRs with the project manager to evaluate the progress of the program.